As we walk through this Peoria Arizona new home you may want to open the floor plan in a separate window to help visualize the layout. If you play around with the fun interactive floor plan, keep in mind that the model described below has the optional master retreat and casita. The Tierra could be a three or four bedroom home depending on whether you want the master retreat or not. There are 2 baths, a dining, living, and family room. Plus you have either a two car garage with casita, or a 2 car garage with a tandem third car garage. 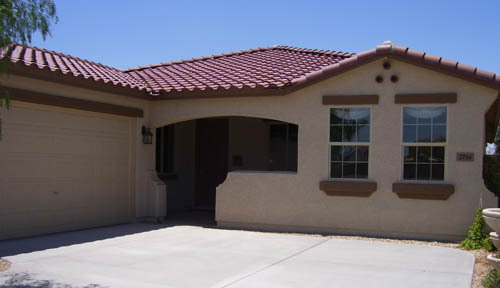 The current trend for buyers of Arizona new homes is that people are looking for a three car garage. 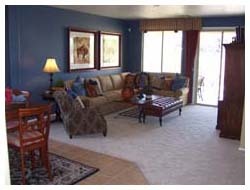 The casita is nice, but it is not requested nearly as often as a three car garage if you are concerned about resale. The tandem garage is attached to the house but segregated from the home. You have to exit the tandem garage and enter the home through the front door. There is no access from the tandem garage directly into the home. Make your teenagers park in it. You can see the nice covered entry porch from the photo above if you are interested in sitting out in the front of your new home. It's nice and shady. I like this feature and it is not common to find on an Arizona new home right now. My kids are still young enough that they enjoy riding their bikes out front. I would like to have a place to sit and watch them that isn't in the direct sun. 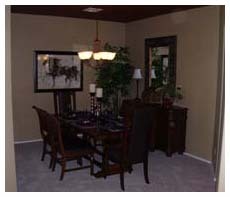 When you enter the home the living room is to your left and the dining room is to your right. I won't call the dining room small, but it's definitely cozy. I'm not a big fan of dining rooms. It seems most people only use them for holidays or when they have company over. You can see the table in there serves six, and there isn't much room for a larger table. Personally I might turn that room into a sitting area with a television and couch for watching Sunday football, or maybe for the kids' video games. You can pass through the dining room into the kitchen. The photo here is taken from the nook. That archway leads back into the dining room and the open doorway is the laundry room that leads into the 2-car garage. The kitchen is good sized, roomy, with plenty of cupboard space. I'm not sure if I like that cutting block island in the center of the kitchen. It is too small, it feels forced. Maybe if you add a pot rack hanging from the ceiling above it or hang some kitchen utensils down from a rack of some kind it may seem more like it is meant to be a part of the kitchen. 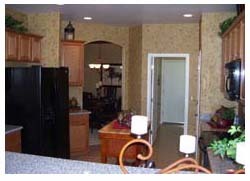 We now walk through the kitchen and you are in the nook and family room. The family room is the right size for a family to sit and watch TV on a Sunday evening. (Does that still happen anywhere?) Having the nook right here gives the family room an open feel. It is very comfortable, which is what a family room should be. 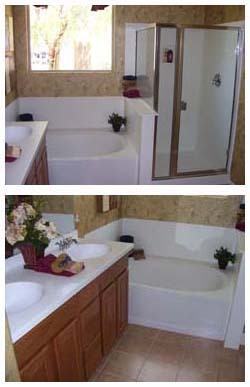 The pictures of the master bathroom don't do it justice. It looks cramped, but the bathroom is plenty big. I am a big fan of the his and hers sinks. The glass shower is a challenge to keep the doors free of hard water spots, but they are much easier to clean than a older style with sliding doors or the "spray water all over the bathroom, curtain style of shower. With all the money you are saving on the utility bills because of the energy efficient features of this home you can spring for a system to take the hardness out of the water. The last rooms I didn't take a picture of are the additional bedrooms. They are very normal. Basically your standard 10x10 room, maybe just a tiny bit larger. Overall I like that this home is one-story and over 2,200 square feet. I do think that Centex could have eliminated either the living room, dining room, or both and made better use of some of the space. They could have increased the size of the family room and turned it into a great room, but that's just my preference. With the flexibility to add a fourth bedroom and also add the casita, I honestly feel this home could be a nice fit for a lot of families. Interested In Viewing this Arizona New Home? As always if you are interested in going out to view this home or any other Peoria AZ real esate, I hope you give me the opportunity to work with you. Please visit our get to know me and "WHY HIRE US" sections before you go look at these homes. If you feel I will be a good fit to work with you then please Contact Me Directly and I will get back to you as soon as I can. Maybe you would like to return to The Preserve at Cibola Vista page to view information about the other models here or to view the energy efficient features if you missed it before. Or you could return to our Peoria Arizona New Home Section to view a different Peoria Arizona new home. I hope to hear from you soon.